Join the MIT Press Bookstore in welcoming Terri Favro, author of Generation Robot, to the store for a reading and discussion. Generation Robot covers a century of science fiction, fact and, speculation—from the 1950 publication of Isaac Asimov’s seminal robot masterpiece, I, Robot, to the 2050 Singularity when artificial and human intelligence are predicted to merge. 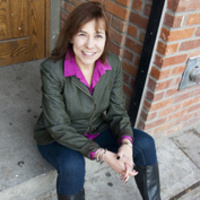 Beginning with a childhood informed by pop-culture robots in movies, in comic books, and on TV in the 1960s to adulthood where the possibilities of self-driving cars and virtual reality are daily conversation, Terri Favro offers a unique perspective on how our relationship with robotics and futuristic technologies has shifted over time.